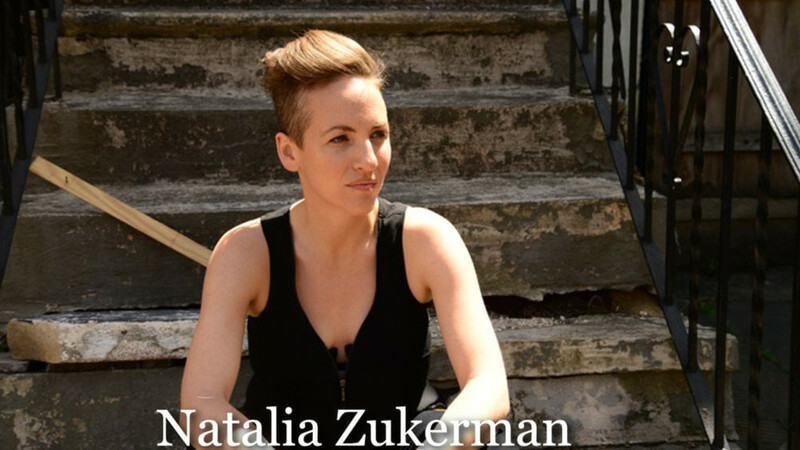 Her songs display “the come-hither sultriness of her slinky, earthy vocals.” Performing Songwriter Natalia Zukerman has a sound that’s strong yet delicate, gentle yet insistent. You can call the music she makes folk if you want, but there’s jazz in it, too, and blues, and a soulful something or other that you can’t quite put into words. Whether onstage or on record, she presents herself just as she is—no gimmicks, no flashy pyrotechnics, only the solid musicianship of someone who knows and loves her craft. Natalia Zukerman’s Weasel Records debut Brand New Frame introduces listeners to her rich layers of top notch guitar playing, contemporary beats and dark, sweet, provocative vocals. Musically sophisticated, intimate and irreverent all at once, this record highlights what’s best about Americana music and offers it a Brand New Frame. It is an album about change. In Brand New Frame, Zukerman challenges listeners to break out of patterns and rhythms that hold them back from reaching the truth. The title track, “Brand New Frame” is a wake up call to those who tell the same stories over and over again to anyone who will listen. “Better Me” presents the idea that the people we are striving to be are there all along, waiting for us to catch up to what we already know we are capable of. “Only Trees” is a metaphor for what Zukerman’s album is all about – that things change: landscapes, ideas, music. In the song she recognizes the way we live our modern lives at breakneck speed, and invites us to slow down. Produced by Willy Porter (www.willyporter.com), Brand New Frame features Zukerman on vocals and guitars, with Dave Schoepke on drums, Dave Adler on keys, Leroy Deuster on Pedal Steel, Bryan Mir on electric bass, Todd Sickafoose (Ani Difranco) and Marty Ballou (John Hammond) on upright bass. The album is also sprinkled with notable guest appearances by fellow songwriters Willy Porter, Melissa Ferrick and Edie Carey. Warning: You may not be able to get over the mesmerizing guitar chops of the talented Natalia Zukerman, but if you can, you will discover layers. Country roads that lead to red barns, antique shops, glass bottles, resonators, lap steels, finger-picking and trembling slides. And alongside these winding roads are back alleys, flagging cabs, and the buzz of a streetlight clicking with kick drums, pleading organs, and speeding electric guitars behind lyrics that delve boldly into work, love, temptation and the journey to personal reinvention. Brand New Frame tells the story of valuing the past while growing new skin; the unraveling of a relationship with realism, humor and tenderness. Zukerman didn’t have to look far as a child to find musical influence. She attributes her rigorous work ethic, discipline and instrumental predisposition to her parents. The daughter of violinist/conductor Pinchas Zukerman and flutist/writer Eugenia Zukerman, Natalia grew up in Manhattan immersed in classical music. Her ears were tuned to perfect pitch, and the guitar dexterity, intricate sense of rhythm and meter evident in her own musicianship came naturally. So did the lifestyle of a traveling performer. Performing live—and experiencing what she calls the life of a “wandering gypsy”—is a family tradition. In addition to her parents, her sister Arianna is an opera singer, and her grandfather played clarinet in Klezmer bands in Poland and later in Israel. In a sense, Zukerman explores family heritage in “Song For Ramblin’ Jack” one of the 10 original songs on Brand New Frame. She explains it is in part about blood-related family but even more so about the extended family of American troubadours who travel the country sharing both traditional and contemporary genres, songs, skills, instruments, and styles. “The song ‘Ramblin’ Jack’ came after a Folk Alliance conference in Austin. I realized there that I was a part of this grand tradition of troubadours that was, for me, as much about my own family of traveling musicians as a shared American history. I consider myself a student of traditional music, even though some would say the noise I make is not so traditional. Since 2004, Zukerman has been touring the country opening shows for roots greats and guitar slingers including Kelly Joe Phelps, Richard Shindell, Lucy Kaplansky, Garnet Rogers, Melissa Ferrick, Catie Curtis, Susan Werner and many others. It was on the road that Zukerman formed the relationship with Willy Porter that would lead to producing Brand New Frame and releasing the album on his label Weasel Records. “Brand New Frame is a perfect fit with what I’ve always wanted Weasel to represent. The small but mighty team here is thrilled to share Natalia’s record, and tremendous talent, with the world.” -Willy Porter.